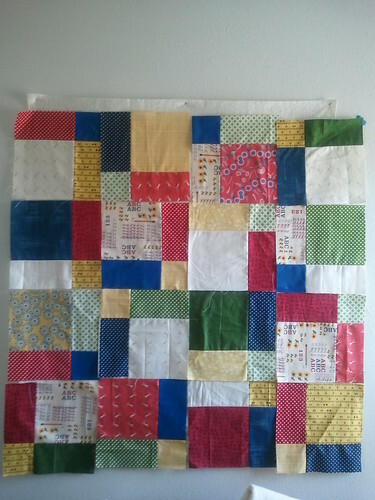 I feel like I haven't actually quilted in forever. It makes me really sad. So tonight after work I'm sitting down and sewing, no matter what! I'm still plugging away at the disappearing nine patch. This is half the blocks that I need. It gets better the more cream-colored blocks that go in [I think? 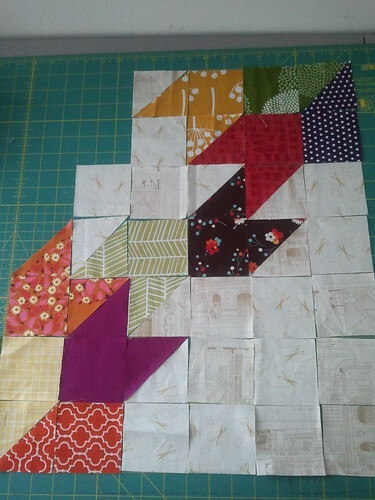 ], so I think the other half of the blocks will have a cream square in every block. Then there's my PTS9 project. I'm hand-sewing rose star blocks whenever I get a moment, but I'm an epically slow hand-sewer, and my whipstitch is a little visible sometimes. So I'm going to keep working on that, but I also want to do a pillow cover that is machine pieced so my partner can pick which she likes best. This was a design that I put up in the group Flickr that the overwhelming majority of people liked. Except I'm not sure it has enough zing. Good thing that as I was contemplating these fabrics last night, a million and one design ideas came to me! 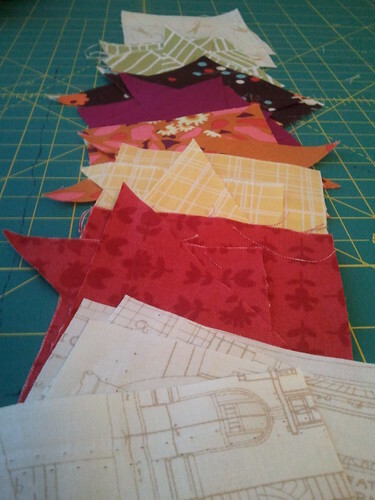 That will be part of the sewing I do tonight, hooray! *Linked over at WIP Wednesday for the first time in forever!